The tragedy of Bad Reichenhall, Germany, from January 2006 raised general questions regarding the inspection of civil engineering structures. The authors' opinion is that a combined approach is necessary to ensure the safety of structures and to improve the sustainability of large structures to avoid sudden collapses. This combined approach is presented in the following. The main purpose of monitoring civil structures is to support regular visual examinations or inspections based on non-destructive testing techniques. 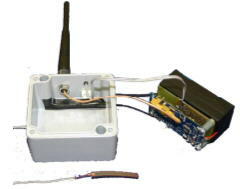 A monitoring technique is presented to consist of a wireless sensor network using different types of sensors including micro-electro mechanical systems (MEMS). Sensor networks can be used to monitor a certain region of a structure providing data about different physical measures. Some properties to be measured in-situ are the Eigenvibrations of the structure, humidity and temperature outside and inside the structure, unusual stress and strain, and the detection of cracks and other deteriorations. An embedded sensor system is developed to acquire the structural condition. A wireless network propagates the sensor data towards a common base station where further analysis is performed. The application of MEMS accelerators to use acoustic emission techniques is discussed. These critical regions can further be investigated by RADAR and impact-echo (IE) techniques. A novel IE technique is presented to characterize defects identified by a monitoring network addressing the detection of voids and honeycombing. Further on, a scanning IE technique is presented to improve the reliability of such data and a technique to detect cracks and to obtain information about the crack depths. Continuous structural health monitoring should provide data from the inside of a structure to better understand its structural performance and to predict its durability and remaining life time. One example of an application are railway bridges that are more and more confronted with higher axle loads and higher train speeds  as probably expected during construction. Another example are structures exceeding the designated life time. In Europe, many structures originate from the late 40ies or 50ies of the last century replacing structures destroyed during the Second World War. Regarding concrete structures their typical lifetime of 50 to 80 years is reached or will be reached soon. Existing monitoring systems use traditional wired sensor technologies and several other devices that are time consuming to install and relatively expensive (compared to the value of the structure). They are using large number of sensors (i. e. more than ten) are expensive and will therefore be installed only on a few bridges. A wireless monitoring system with MEMS (Micro-Electro-Mechanical-Systems) sensors could reduce these costs significantly . MEMS are small integrated devices or systems that combine electrical and mechanical components that could be produced for less than 50  each. The principle of such a system is shown in the scheme given in Fig. 1. Currently, a wireless sensor node with such a MEMS sensor could be fabricated at a price varying from 100 to about 400  and future developments show the potential for prices of only a few Euro. Monitoring systems equipped with MEMS sensors and wireless communication can reduce the costs to a small percentage of a conventional monitoring system and therefore will increase its application not only in monitoring bridges. Due to the detailed information of the structural behavior of bridges obtained from the monitoring system, maintenance costs could also be reduced, since inspection methods (addressed i.e. in the following chapter) can be applied more efficiently. Only after certain changes in the structural behavior have been identified, an inspection (either by means of non-destructive testing or visual methods) is necessary and proper repair could be done right after the occurrence of the defect. This reduces the risk of further damage. The analysis of measured data and the knowledge of continuous changes of structural behaviour will also improve the life time prognosis of civil structures reducing the overall maintenance costs of buildings and transport networks. Data has to be continuously transmitted (e.g. using the internet) to the supervisor. Each sensor device (mote), which is itself a complete, small measurement and communication system, has to be power and cost optimized. Using multi-hop techniques, the data of the sensor network has to be transmitted over short distances of some 10 m to a base station on site. There the data items are collected and stored in a data base for subsequent analysis. This data can then be accessed by a remote user. If the central unit detects a hazardous condition by analyzing the data, it has to raise an alarm message. The central unit also allows for wireless administration, calibration and reprogramming of the sensor nodes in order to keep the whole system flexible. Each mote is composed of one or more sensors, a data acquisition and processing unit, a wireless transceiver and a battery as power supply (Fig. 2, right) [3, 4]. The acquisition and processing unit usually is equipped with a low power microcontroller offering an integrated analogue to digital converter (ADC) and sufficient data memory (RAM) to store the measurements. This unit also incorporates signal conditioning circuitry interfacing the sensors to the ADC. In the following sections, some components are mentioned, but a more detailed description is given elsewhere . A structural health monitoring system is supposed to work for longer periods of time, e.g. for several months or years, and the size of a mote is not as important as in other applications (e.g. medicine). In order to achieve maximum life time, an effective power supply has to be chosen and a mean power consumption of about 2 mW per mote should not be exceeded. Due to these power constraints communication should be restricted to as few data as possible. In contrast, computation is much cheaper and large amounts of energy can be saved if communication is substituted by computation. Therefore the mote has to locally pre-process the measurement data and extract relevant parameters. Then only a few bytes describing the signal characteristics have to be sent to the base station. Fig 2. Size of different sensors for structural health monitoring used today compared to a 10 Cent  coin (left) and developed MEMS based multi-sensor system by the authors. There are different alternatives to obtain data related to the status of a structure. To achieve a long working time of the sensing unit, passive sensors seem to be the best choice. They do not require electric power, because they obtain their energy directly from the change of physical quantities. Piezoelectric materials are an example of such materials. But also active sensors could be of interest, so they require additional electric power to work properly. In Fig. 2 examples of MEMS sensors are shown and their size is compared to conventional sensors. Most of the MEMS sensors incorporate signal conditioning circuitry and/or A/D-converters and therefore require additional electric power. Hybrid motes combining sensor systems using different measuring concepts (active or passive sensing, piezos, active fibers, MEMS and so on) can be designed to optimize the data acquisition and to best fit the in-situ requirements. Based on our mote developments a strain-gage hybrid sensor system was developed (Fig.3). Some physical properties to be measured in-situ are the vibrations of the structure, humidity and temperature outside and inside the structure, stress and strain, and the detection of cracks and other deteriorations. Approaches using acoustic emission techniques for the latter were discussed in papers by one of the authors elsewhere [e.g. 5]. It is necessary to divide monitoring into discrete and event based monitoring, which is similar to data recording on request or, on the other hand, event based data aggregation. The relation between these techniques and the described quantities to be measured is considered in the next section. Additionally, the whole monitoring system, which has to be installed on site, has to withstand rough conditions (climatic and other types). For example, it has to be resistant against oil, fuel, salt, alkali and other chemicals. Thus, sensors have to be robust and durable such that their measured data is reproducible and reliable over the monitoring period. Furthermore, the system stability, which includes the wireless data transfer to and from the sensor nodes, should be high. Applying acoustic emission (AE) analysis techniques at unusual low sampling rates of less than 100 kilo samples per second are recommended for on site wireless monitoring. For long travelpaths, most of the energy in the higher frequency range is attenuated before it reaches the sensor. Broadband transducers with a band width of 3 to 100 kHz or less seem to be appropriate. MEMS-based capacitive sensors as well as conventional piezoelectric sensors could be used for wireless monitoring. Besides, the most important aspect of AE applications in this scenario is the evaluation of algorithms suited for the data processing in wireless sensor networks. It was shown  that complex algorithms can be applied using similarities between AE events or array techniques already applied in seismology in a different way. Additionally, the problem of time synchronization of sensors in a cluster of a network has to be solved to provide a common time basis for the localization. The calculation of similarity matrices is a powerful tool to investigate clusters of events and to discriminate between acoustic emissions from cracks and noise. The Akaike information criterion is a helpful tool for automatic onset detection . The onset is required for three-dimensional source localization which leads to high resolution images of the investigated damage process. Array techniques enable a detection of the direction of the approaching wave. Using a network of sensor arrays, two-dimensional source localization is possible. Since it is recommended to minimize the data transfer through the radio module, the signal processing and data analysis should be done, as far as possible, in the sensor mote. Aggregation functions like MIN, MAX, COUNT, etc. can be used for certain types of data in order to further minimize the amount of transmitted data. However, signal analysis could be made by software or by special hardware. In addition to the local signal processing techniques running on a single mote, useful information within clusters can be aggregated in intermediate nodes and forwarded as needed in compound packets that save energy. In general, data aggregation and reduction methods are needed to minimize the data traffic of interest if the monitoring system consists of a large number of motes. Storing first a set of data in the sensor mote and then sending it successively through the radio module at specific time intervals, events or on request will also improve the reliability of data, because data transfer could be specifically controlled. As a first approach to this problem, the data management framework TinyDBŠ will be tested together with self-configured motes (Fig. 2). For structural health monitoring purposes, it should be possible to provide better in-network data aggregation using a TinyOSŠ environment. The need for cluster formation and management is motivated by power consideration as well as by the necessity to decide whether or not an event (noise, for example) is related to a structural defect or change in structural behaviour. These clusters need to organize themselves and determine the cluster head based on the current conditions of the network. Despite the approaches using novel acoustic emission techniques described above it is obvious that a monitoring system can only support the routine inspection of structures. Usually, a visual inspection is conducted by qualified examiners. A continuous monitoring of the structural health (using an AE system for example) can support these inspections by indicating areas which need further attention. However, complex structures might need special methods used by the examiner enabling for a deeper look insight the structure. Different non-destructive testing (NDT) methods can be used as a tool in many cases and due to the demands for quality control and sustainability of structures in civil engineering, a growing market for NDT has evolved. Regarding concrete structures, several methods are already well-introduced concerning defect characterisation. Ultrasound, radar, thermography, electro-potential-field methods and others are currently being used to detect voids, cracks, corrosion, etc. - with varying success. Impact-echo (IE) methods improved the detection of voids and honeycombing and to measure the thickness of concrete parts with good accuracy . For that reason, impact-echo was chosen to be the standard technology for quality control of tunnels in Germany and it the first NDT technology to be part of a German regulating standard for quality control in civil engineering. However, this technology is still not widely accepted due to the poor handling and limited functionality of commercially available equipment based on this approach. Moreover it was shown that single-point measurements are somehow more difficult to be interpreted compared to measurements using a scanning technique. The so-called scanning IE technique was developed. Based on the development of new hardware (Fig.4) some improvements regarding void as well as crack detection were made. The system has already the potential to be used in quality control of cementitious materials during setting and hardening, shown by Grosse et al. . It is now used also in the frame of the mentioned collaborative project "Sustainable Bridges" [1, 9]. The impact-echo method uses transient stress waves generated on the surface of concrete or masonry structures by an elastic impact . As the stress waves propagate through the material being tested, they are reflected by internal interfaces (discontinuities in the material) and external boundaries of the structure. The developed test system consists on the hardware side of a transducer and an automatic impactor as well as a data acquisition PC card. The equipment is light, mobile and controlled by a rugged sub-notebook or a tablet-PC. The device is optimized for rough environments and fast and easy data acquisition. For the detection of voids and cracks, the impact should generate a short relatively high energy but nevertheless non-destructive pulse with broad frequency content. The developed impactor operates on the basis of high speed tubular solenoids meeting these requirements. It is equipped with an electronic control unit interfacing to external devices that allows the operator to fully control the impact generation and also gives feedback on impact time and duration. As personnel costs are crucial for in-situ measurements, reducing the complexity of the testing process is essential for further acceptance of this technique. On a steel reinforced concrete road bridge (96 m length) in Stuttgart the capabilities of the IE technique and in particular the new hard- and software were tested to detect voids and mounting parts (Fig. 4, right). Some results of these measurements can be found in . Basing on a derivate of time of flight techniques a crack detection method was developed using the same hardware (Fig.4). It is able to detect hidden as well as surface cracks and to measure the crack width and crack depth. These tests have shown that the cumulative energy (samplewise addition of the squared amplitude of the received signal) is a good discriminator between concrete with and without cracks. An even better resolution can be obtained by combining this technique with Radar measurements. More details are published by Grosse et al. . The inspection of building structures and especially of bridges is mainly done visually nowadays. Therefore, the condition of the structure is examined from the surface and the interpretation and assessment is based on the level of experience of the engineers. An approach to continuous structural health monitoring techniques based on wireless sensor networks were presented, which provide data from the inside of a structure to better understand its structural performance and to predict its durability and remaining life time. A wireless sensor network system based on MEMS and hybrid sensors is developed by a team of scientists from different institutions (IWB, Smartmote, IPVS and EMPA). The network is equipped with motes and will be available for a very low budget. Since prototypes are already available, the system is now under an optimization process regarding power consumption, data acquisition and data aggregation, signal analysis and data reduction . Using this technique, monitoring of large structures in civil engineering becomes very efficient . The IE technique has the potential to detect precisely large voids, honeycombs and inhomogeneities as well as the thickness of concrete structures. In these terms it is a perfect addition to the described monitoring system giving a more detailed insight to a structural part determined to be critical by the wireless sensors before. The new IE device reduces the time necessary for each measurement by a factor of ten. Some applications are described concerning the detection of cracks. First promising results were obtained using the cumulative energy of the transmitted signal as a crack discriminator. Essential is that the new system provides a more reliable impact generation. The presented work and developments were supported by the Deutsche Forschungsgemeinschaft (DFG) via project FOR384 (Impact-Echo) and by the European Community in the frame of the project "Sustainable Bridges" (Monitoring). The first author is also indebted to the Deutsche Forschungsgemeinschaft (DFG) for the scholarship grant GR-1664/2-1. Both authors are also grateful for the discussions with Prof. Dr. H.-W. Reinhardt and the help of R. Beutel, G. Bahr and M. Schmidt as well as for the support by their colleagues from IPVS Stuttgart (O. Saukh, P. J. Marrón, K. Rothermel) and EMPA Zürich (J. Meyer, G. Feltrin). Sustainable Bridges - Assessment for Future Traffic Demands and Longer Lives. 2005. Integrated Project in the Sixth Framework Programme on Research, Technological Development and Demonstration of the European Union, FP6-PLT-001653, http://www.sustainablebridges.net. Grosse, C. U., F. Finck, J. H. Kurz and H. W. Reinhardt. 2004. "Monitoring techniques based on wireless AE sensors for large structures in civil engineering", in Proc. EWGAE 2004 symposium in Berlin, BB90, pp 843-856. Berlin: DGZfP. Krüger, M., C. U. Grosse and P. J. Marrón. 2005. "Wireless structural health monitoring using MEMS". In: W. M. Ostachowicz et al. (eds). Damage Assessment of Structures, 4th - 6th July 2005, Proc. Intern. Symp., Gdansk, Poland, Zürich: Trans Tech. Grosse, C. U., M. Krüger, J. H. Kurz, H. W. Reinhardt, P.J. Marrón, K. Rothermel, J. Meyer and G. Feltrin. 2005. "Wireless monitoring of concrete structures using micro-electro-mechanical sensors (MEMS)" in Proc. of the Int. Conf. on Concrete Repair, Rehabilitation and Retrofitting ICCRRR, Cape Town, South Africa, Nov. 2005, Balkema Publ. Rotterdam (eds. M. Alexander et a. ), 2005, pp 493-494. Grosse, C. U., F. Finck, J. H. Kurz and H. W. Reinhardt. 2004. "Improvements of AE technique using wavelet algorithms, coherence functions and automatic data analysis techniques", J. of Constr. and Build. Mat., 18 (3), pp 203-213. Grosse, C. U., H. W. Reinhardt, M. Krüger and R. Beutel.2005. "Application of Impact-echo techniques for crack detection and crack parameter estimation in concrete", extended abstract, International Conference on Fracture ICF-11, Turin 20-25 March 2005, (on CD-ROM). Grosse, C. U., H. W. Reinhardt, R. Beutel. 2004. "Impact-Echo Measurement on Fresh and Hardening Concrete", in: Concrete Science and Engineering, K. Kovler, et al. eds., RILEM PRO 36, RILEM Publ. S.A.R.L., pp 95-104. Grosse, C. U., R. Beutel, H. W. Reinhardt, M. Krüger: "Impact-echo techniques for non-destructive inspection of concrete structures". Int. Conf. on Conc. Repair, Rehabilitation and Retrofitting (ICCRRR), Cape Town, South Africa, Nov. 2005, Balkema Publ. Rotterdam (eds. M. Alexander et al. ), 2005, pp 174-176. Grosse, C. U., J. Kurz, R. Beutel, H. W. Reinhardt, M. Krüger, P. J. Marrón, O. Saukh, K. Rothermel, J. Meyer, G. Feltrin. "Combined Inspection and Monitoring Techniques for SHM of Bridges". International Workshop on Structural Health Monitoring (IWSHM) 2005, Stanford University, Stanford, CA, September 12-14, 2005, Ed: Fu-Kuo Chang; Lancaster PA: DEStech Publications Inc. (2005), pp 1403-1410. Krüger, M., Grosse, C. U. "Preiswerte Dauerüberwachung von Bauwerken mit drahtloser Sensorik", DGZfP, Fachtagung Bauwerksdiagnose, Berlin, Februar 2006 (in print). Glaser, S. D. 2005. Advanced Sensors for Monitoring Our Environment, Proceedings, 1st International Symposium on Advanced Technology of Vibration and Sound, Miyajima, Japan, 1-3, June.